A fiendishly clever mystery in which Dr. Siri and his friends investigate three interlocking murders -and the ungodly motives behind them. Laos, 1979: Retired coroner Siri Paiboun and his wife, Madame Daeng, have never been able to turn away a misfit. As a result they share their small Vientiane house with an assortment of homeless people, mendicants, and oddballs. One of these oddballs is Noo, a Buddhist monk who rides out on his bicycle one day and never comes back, leaving only a cryptic note in the refrigerator: a plea to help a fellow monk escape across the Mekong River to Thailand. Naturally, Siri can't turn down the adventure, and soon he and his friends find themselves running afoul of Lao secret service officers and famous spiritualists. Buddhism is a powerful influence on both morals and politics in Southeast Asia. In order to exonerate an innocent man, they will have to figure out who is cloaking terrible misdeeds in religiosity. This series is one of my favorites. Bizarre, funny, and informative about Southeast Asian history culture and politics. Please keep them coming. While the sociopolitical history is present, the mystery and suspense are woven throughout, and the sly humor abounds, this one is filled with the supernatural. There are dark things, but they seem more balanced, or maybe that's an illusion caused by Mme Daeng's new tail! All I know is that I thoroughly enjoyed it! Clive Chafer continues to be excellent as narrator. I was disappointed. I could not connect that well with the characters. The plot was a bit scattered and there was too much mysticism as well. The narrator has a wonderful voice but a few of the key the character's voices were too similar. I felt I wasted time on this book I am sorry to say. l have learned a lot about Loas and enjoyed a good story. I would recommend it highly. What can I say - they just keep getting better. We finally get to go to Thailand. Dr Siri has religion-based adventures. One of the very best series! One of the best detective series today! I just wish they would make it into a television series. The characters are all perfectly done and the story has elements of surprise and sometimes , whimsy, that are alway interesting. With so many seniors active today, I think this series would play well. Yeah for dr salee and dame! Please keep amazing us in all your adventures! Loved the story; love all of the Thai and Laos series. No ending here, though. This book is a bit of history, a bit of geography, quite a bit of fantasy/magic/dreams, a bit of mystery, lots of characters with multiple names and titles and a bit of humor. I liked it but was confused by it. Y'all judge for yourselves. Initially, I found it hard to follow the story -- I think I listened to the first three chapters at least twice. But once I realized that it was all pretty far out on the fanciful side of life, I settled in and enjoyed listening to it. I listened to The Coroner's Lunch first, which I quite enjoyed, and which is earlier in the series. This is alright and has some great insights and funny moments, but the plot is at times confusing with various monks in story, takes some effort to keep them straight and I got lost somewhere along the way. I would gladly listen to another book in this series, and I would probably enjoy it. 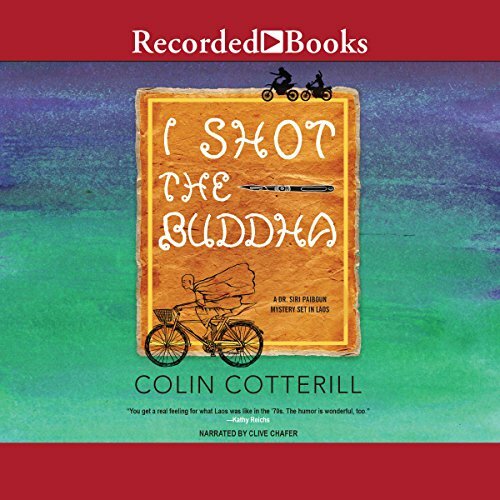 Halten Sie die Hörbuch-Ausgabe von I Shot the Buddha für besser als das Buch? Welcher Moment von I Shot the Buddha ist Ihnen besonders im Gedächtnis geblieben?